Who doesn’t like to carve out their own little fiefdom, now and then? Whether it’s a man cave at home, a special project at the office, or a particular job in some organization, there’s a satisfaction to be had in owning your own personal space or role. A sense of freedom knowing you’re in control. Putting your own personal touch on something is rewarding, and it’s nice to see the results of accomplishing that goal for which you’ve exerted so much effort and planning. Of course, this overarching element has always been endemic to hobby gaming, and there’s one specific mechanic that has proven to be a natural fit in capturing that feeling. Area Control/Majority: How Does it Work? Area control/majority awards players points and/or rewards, powers, abilities, or benefits for having a presence or influence in a particular, physical space on a shared game board. There are two distinguishable types of influence to this mechanic. One implementation limits the outright ownership of any one area to a single individual. This is most commonly seen and immediately recognized in war games. The other type of influence is when the game allows multiple players to occupy any one space, rewarding the one who has a majority presence. You might also receive benefits for being 2nd, 3rd, or etc. This application is more popular in Euro-style games and tends to be more recent in the hobby…relatively speaking. Additionally, this mechanic will tend to use some sort of map that is represented on the game board and can involve movement in conjunction with control. Many games depict spaces on a board, but may be more associated with independent actions or some other mechanic. For example, in worker placement games you can “control” spots, but typically that is a temporary, one-turn action. Area control involves more fluid, evolving, and congruous interrelation from turn to turn. While thousands of titles involve physical occupation of, and movement around, various spaces on a board, it is important to distinguish that true area control games derive their rewards expressly from having said presence in those spaces. If not, then the game has some other, more important goal. For example, Chess involves physical area control, but there are no benefits derived from that; rather instead, the objective is to capture your opponent’s king. The first area control game of the modern era listed on the Board Game Geek database is interestingly a trivia game. In Way to the White House (1927), players compete via a spinner and correctly guessing state capitals to claim states for electoral votes. Therefore, controlling some states would be worth more points than others. And while many games in the genre would later incorporate that concept, WthWH is really barely in the nascent beginnings of area control. The genre that naturally developed this mechanic’s formative years is war gamming. Two early, simplistic examples would lay the foundations for later, complex designs. One I’m sure you’ve heard of; the other probably not. Conquest (1936) and the iconic Risk (1959) both revolve around the control of territory. In Conquest, you earn points for capturing land and gain bonuses for holding all of the territories of the same color. In Risk, the ultimate goal is to completely conquer the world. However, you do receive reinforcements based on the numbers of countries under your control, as well as the popular bonus armies received for holding an entire continent. Suffice it to say, all war games can lay claim to a modicum of area control in that opposing armies are fighting over physical space. However, to truly fall within the boundaries of the genre’s attributes, there should be some benefit beyond a relevant strategic advantage to the amount and/or type of territory controlled. If space is present namely for logistics or convenience, it’s really more a mechanic of area movement, as opposed to strictly control. Some war games identify specific spaces, for example a select number of hexes, as victory conditions, but that is more an end-goal, rather than area influence. Many other war games do tie direct benefits into controlling physical spaces. Dune (1979 – later Rex, 2012) requires control of a certain number of strongholds for victory and also coordinates area control with earning the game’s main resource, spice. The famous, or infamous, Axis & Allies (1981) is primarily concerned with wearing down your enemy’s military machine, but your economy – and thus ability to fight – is intricately connected with the amount of territory you control. So many war, conquest, and political games – whether dudes-on-a-map, hex-and-counter, or in between – will utilize area control, but may not associate direct benefits with that. There are a number of heavily thematic, interactive, epic not strictly war games that do. Similarly in a fashion to Dune, these work the mechanic in among a number of varied other elements. However, area control is still a, if not the central focus as it will earn direct rewards in the form of victory points, money, troops, and/or other resources. Some influential examples include War of the Ring (1977), Warrior Knights (1989), History of the World (1991), Successors (1993), Twilight Imperium (1997), Struggle of Empires (2004), and Twilight Struggle (2005) to name but only a handful. Moving out of the war game and closely related genre, Euro games can add a unique dimension by including area influence without always being so in-your-face confrontational. One of the earliest titles was Manhattan (1994). This tile-laying, building game scored for the construction of skyscrapers in various neighborhoods, awarding extra points to players with a majority of buildings in each area. But the grand-daddy of them all that put area majority on the map is the redoubtable El Grande (1995). El Grande was the first commercially successful title built around area majority. Through card play to resolve actions, the primary goal is to place caballeros (cubes) in various territories on the board. On separate occasions, these individual areas will be scored and the players with the 1st, 2nd, and 3rd highest majorities will earn points based on what that region gives. There are also opportunities to move opponents’ caballeros, change-up scoring, or score regions early. These variable powers allow for some fun interaction and unpredictable moves that make the game both strategic and engaging. El Grande’s area influence mechanic has spawned a number of designs and influenced parts of many others over the years. San Marco (2001) is extremely close to El Grande in placing and moving aristocrats through card play in order to achieve majorities in various districts as the doge comes around to score. Carolus Magnus (2000) has some parallels as far as majorities in territories and the use of a common pawn – in this case Charlemagne – to initiate scoring. However, that game includes an interesting twist in that the pieces, paladins of five different colors, can be moved by all players as you try to claim a majority of them in order to control a color set when it scores. Five years after El Grande, Michael Schacht introduced what is probably the purest area majority title, Web of Power, since rethemed as China (2005). Again, through a simplified card play mechanism, players attempt to place two different types of pieces to gain a majority and control over regions. The unique twist here is that scoring is not predetermined by the individual areas. Instead, it is based on the total number of pieces played to the region, with a smaller score awarded to second place. More abstract than even most Euro games and with less interaction, Web of Power/China distills area influence to its core for a quick-playing, easy-to-learn, and strategic game. Small World (2008) is another popular heavyweight in the hobby and a solid representative of the mechanic. As Web of Power/China is area majority writ simple, Small World (originally Vinci, 1999) is area control writ simple. The common aspect in Small World is that the objective is to conquer and control territories for victory points. The means to achieve that is with army tokens and simple mathematics – you bring one extra token than the opponent has in armies and terrain modifiers. The twist is that territories score differently depending on the race and characteristic that you are playing, both of which are randomly paired and different from game to game. So a forest terrain may be worth two points to one player, but only a single point to another. Another prominent variety of area influence involves laying tiles or other pieces onto a grid in order to create an ever-changing or expanding territory. 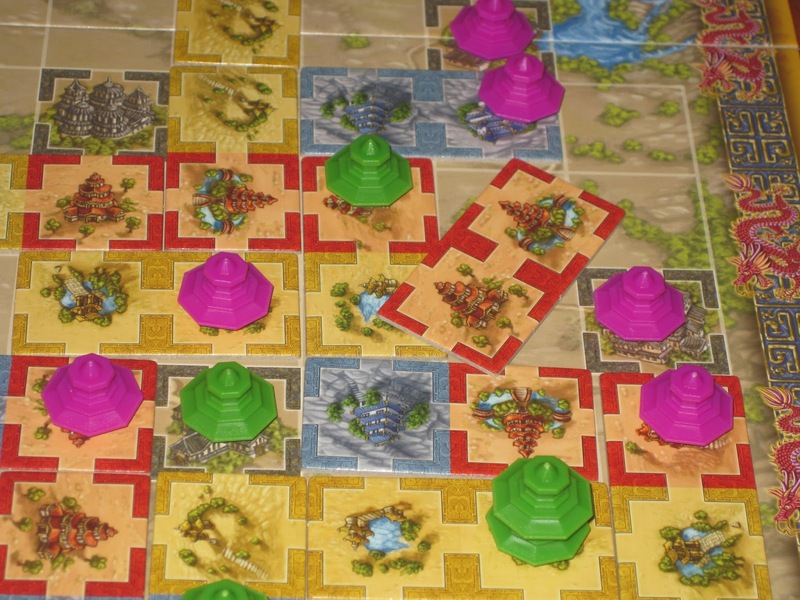 In Löwenherz (1997 – later Domaine, 2003) players take actions to expand their control over grid spaces by playing walls for growth and knights for protection. Different terrain types within these spaces are worth different points and offer special resources. That same year, the classic Tigris & Euphrates incorporated a tile-claiming mechanism, also on a grid, with the goal of placing congruous tiles of the same type to establish a majority for strength when contesting areas. 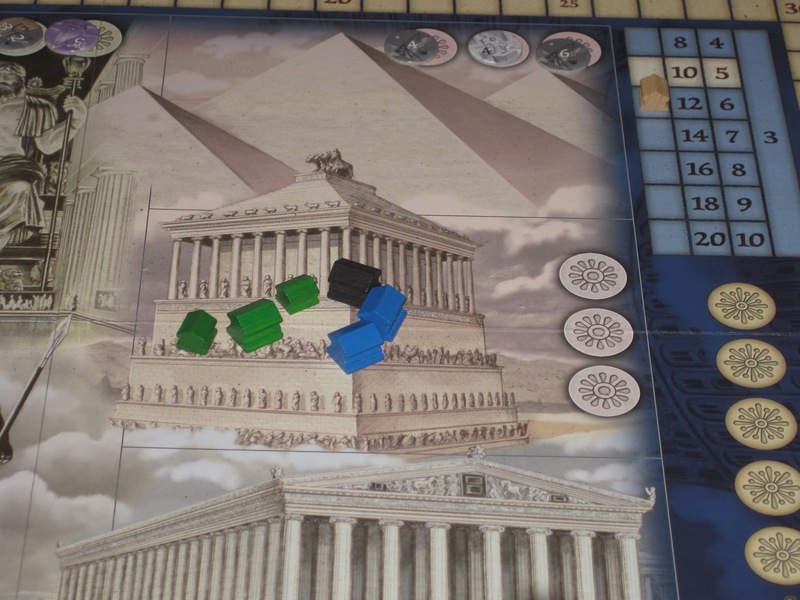 Players also strive to control a 2×2 square in order to build monuments for more benefits. More than a decade later, designs still exhibit this dynamic aspect to area influence. Urban Sprawl (2012) uses a grid to represent a city in which players construct buildings with payments given to majorities in various rows and special powers awarded to those with the highest values in certain categories of structures. Many mechanics are also quite versatile, and area majority has integrated very well with a number of other gaming mechanics. Entdecker (1996) and Carcassonne (2000) both employ tile-laying simultaneously with placing pieces to claim different types of areas which all score in distinct ways. The pick-up and deliver title Himalaya (2002) grants monopolies and extra points to players with a majority in different types of goods. Mission: Red Planet (2005) utilizes role selection to place pieces in regions. And Rattus (2010) also incorporates role selection and programmed movement with the twist that sometimes you don’t want to have the majority in a region because you lose pieces to the plague! Even worker placement games can delve into area influence, despite the fact I said above they are generally not. Belfort (2011) uses standard worker placement to claim different areas for a traditional style of majority scoring. 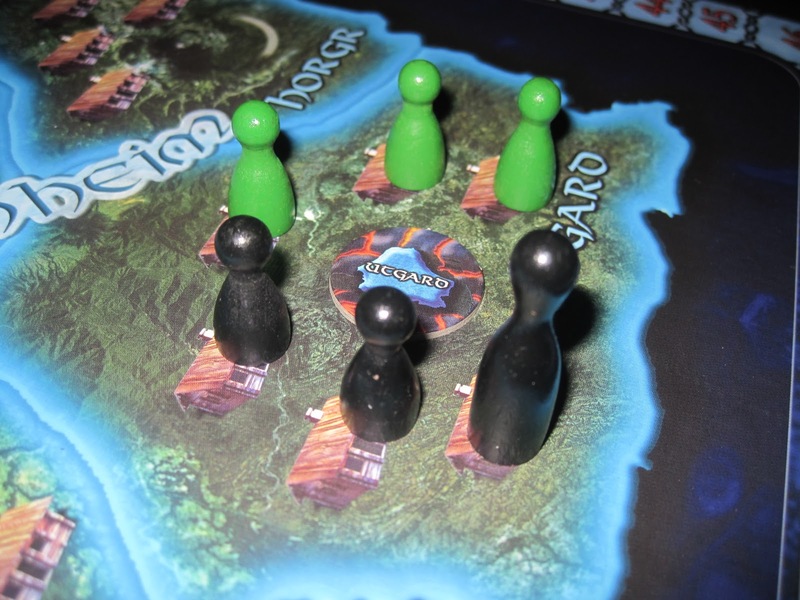 Lancaster (2011) creates a modified version of worker placement to deploy knights to various areas, one of which are counties on the game board. When knights from opposing players occupy the same county, a fight ensues with victory going to the larger army, or majority of knights. Finally, CO2 (2012) also takes advantage of the worker placement element to construct projects in various world regions, with players claiming those areas and their resultant benefits by building the best projects. While mainstream worker placement games generally do not strictly fit the attributes of area control, it is interesting to note that these three examples use a map – of a city, country, and the world respectively – which does happen to be an extremely common element to area control. All of this only scratches the surface of the array of titles that use area control/majority and the many ways in which it can be applied. It has proven a natural fit to board gaming from the hobby’s earliest days and designers continue to experiment with unique ways to incorporate the simplistic mechanic into an ever-growing number of designs. Typically, area control games provide an easily discernible goal. It is easy enough to explain that players must achieve certain objectives in particular areas for specific benefits. In other words, you know what you need to do. In the most basic implementation, players may simply be fighting over control of some place, winner take all. Yet even in more layered forms with majority influence, understanding how to play for various levels of influence is also generally intuitive. Along the same lines of clearly defining goals, the mechanic also makes it practical to visibly judge one’s progress, sometimes as easily with a quick glance. If conquering territory is the means unto the end, take a look at the map. If majority influence is the objective, then just count up the pieces in the area. Even if other factors impact scoring, the state of the game board doesn’t lie and will generally give a good indication of where everyone stands. Area control is also one of the most fundamental, if not oldest, elements used to add interaction in gaming, giving players something to fight over. Within the modern hobby, early games implemented the mechanic for direct conflict, as in war games. However, more recent Euro games have used area influence as a way to implement more indirect confrontation. Beating another to the majority in a space is often a more palatable style of conflict than eliminating them altogether. By either aggressive or passive-aggressive means, area control is a solid mechanic to keep players engaged in a game since one player’s turn will almost always have an impact on your own. Ironically, interaction can also be the biggest downside to area control/influence. On the war game side, and the heavily thematic epics that are closely related to them, area influence usually translates to direct and abrasive conflict with the possibility or goal of elimination. That often appeals only to a select group of hobby gamers. If it was merely a matter of simple turn-off for Euro fans, that’d be one thing. However, those games are also very difficult to entice families, casual players, and non-gamers. On the Euro side, it may not be as contentious an issue, but there will still be many who prefer to forgo interaction, even of the passive kind, and stick with more puzzle-like affairs of solitaire efficiency. One minor disconnect that can sometimes arise with area control is the inability to judge the worth vs. cost of a contested space. Usually this sort of analysis comes with experience, but some players can get too focused on high value areas and overspend resources which leaves them unable to contest other spots. Oftentimes, a good strategy is to vie for control of several, lower value areas as opposed to a single, large target. This is commonly exacerbated in 3-player games as one player can take advantage of the other two over-committing in a dual struggle over one or more areas. These are just a few titles that we here at iSlaytheDragon recommend in this category, along with a brief note as to why you might want to check them out. 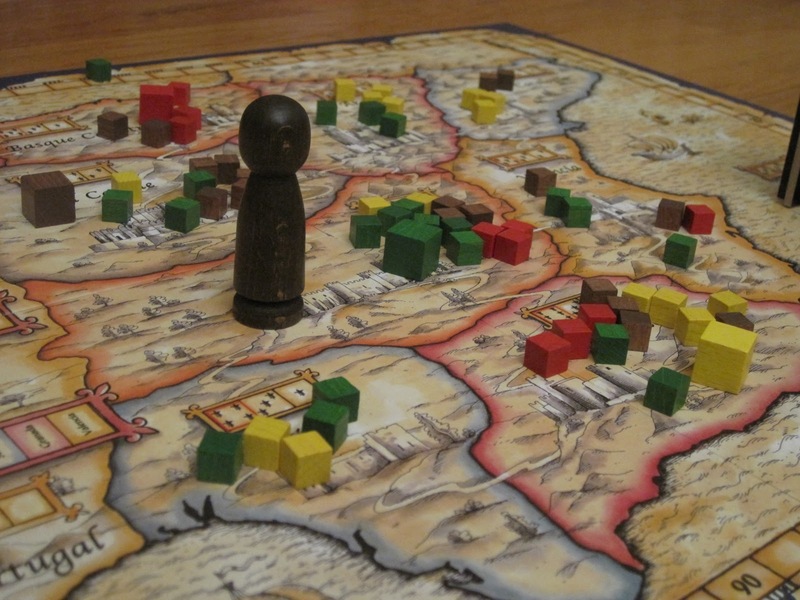 El Grande was the first critically successful area control game, and it remains one of the best. The game combines bidding, bluffing, and secrecy into a beautiful package. It’s best played with four or five. An essential classic to represent the mechanic in your collection. Twilight Imperium uses area control to award resources (is there any game mechanism TI doesn’t use?). Web of Power/China distill area majority to its basics, stripping away all other mechanics for a streamlined, intuitive, accessible and challenging pure area influence game. Another must own for the genre. Cave Troll is an inexpensive game featuring area majority with adventurers battling it out with orcs, other things, and the CAVE TROLL himself to get the most treasure. Tower of Babel is primarily a negotiation game but with area majority scoring. Players get influence in various wonders for contributing to their completion. The twist is that players can trade getting influence on the wonder for collecting tokens that are worth points at the end of the game. This is an underrated gem from Reiner Knizia. Mission: Red Planet uses a fun and clever role selection mechanic to send astronauts to vie for majority of various regions in Mars. Two scoring rounds are straight-forward, but in a fun twist, the final one is chaotically influenced by certain discovery cards that you may or may not know about! Midgard is an area control game where the board is constantly being destroyed. Players control Viking hordes, and while scoring points by controlling regions is a major path to victory, players also score points by occupying regions and by dying gloriously in battle. This game also includes card drafting and plays easily within an hour. Revolution! is an interesting area control game in that players bid using three currencies both for extra money to bid and for the privilege of placing cubes on the board. This game can be cutthroat, but the blind bidding system sets this one apart. Small World is a classic area control game with wildly varying race powers that affect how the areas score points for you. Plus, you can switch races several times throughout the game. Ascending Empires uses a sort of area control with its planets, although the areas are separated by distance and includes a clever dexterity mechanism to get between them. Rex is an area control game with a brilliant combat resolution mechanism, unique powers, and tense alliances and betrayals. It also received our Game of the Year award for 2012. Here’s a brief timeline of titles using area control/majority. This is by no means a comprehensive list, merely a representation of some popular, unique and/or significant games utilizing the mechanic. What do you think about the area control/majority mechanic? Do you have other thoughts about its benefits or drawbacks? Perhaps you have a favorite title that’s not on our recommend list or the timeline? Thanks for such a fascinating, in-depth post on the area control mechanic. Belfort was the quintessential game that came to mind when I saw your topic, even though the only benefit of controlling area in that game is victory points in the scoring round. There is no additional benefit (like money or actions) from dominating a sector of the city the way there is in, say, Risk or A Game of Thrones. Oh, except that there is a benefit for controlling the guild in each district. Thanks for recommending El Grande in particular. I have just added it to my wish list. Thanks for the comments! Another historical note of reflection on Way to the White House is I think that was in the days when the Democrats were identified by red and the Republicans blue…ha!